This presentation was given by James Wallbank at ISEA 98 to an audience of digital artists, activists, educators and arts administrators. It challenged the "REVOLUTION" theme of the conference, and suggested that much digital arts activity is complicit in a massive marketing push that has more to do with selling computers than is has to do with revolutionary ideas. James Wallbank is the founder and coordinator of the arts group Redundant Technology Initiative. As an introduction, to give you a very brief idea of where I'm coming from, I'm an artist, and I'm coordinator of the arts group Redundant Technology Initiative. I make artworks and run projects, so I'm aiming this talk to be reasonably down-to-earth, connected to real world problems, not high artistic theoretising. Whether or not you, ISEA attendees, are digital artists or not, what I have to say should be relevant because if you use information tecnology for any purpose whatever then you are part of the issues I'll be talking about. This talk splits into two halves - the first half, my analysis of the situation, and the second half, which describes Redundant Technology Initiative, a response to the situation, and, I hope, a pointer to some ways forward for all of us. We're here to talk about "Revolution". If the word revolution has any positive connotations, it conjures up in my mind images of a mass popular movement, a general, diffuse, decentralised will to take back democratic control from an unrepresentative elite. Is this what's really happening with information technology in the arts? Are we really suggesting that digital art is somehow at the cutting edge of a revolutionary new age of popular empowerment? 55% of the population able to word-process a letter of complaint. I suggest that the latter is far more revolutionary - that giving the mass of the population the tools to communicate more effectively is something that can change society far more fundamentally than an added advantage for an already priveliged elite. Isn't it closer to the truth to admit that we, digital artists and people promoting digital arts, are a well financed, highly priveliged, arty clique who want to play with expensive techno toys whatever the cost and whatever the implications. So my thesis, that forms the basis of this presentation, is that much current digital art does represent a revolution, but it represents a revolution in sales, not a revolution in ideas. The personal computer is a marketing man's dream. It's the perfect product, a high price, mass market product which holds out the possibility not just of built-in stylistic obsolesence, as with, say, clothes - which go out of fashion - but also of built-in functional obsolesence. In other words, the product actually stops being able to do the job it's intended for after an artificially reduced period of time. But - and here's the real beauty of this product to the industry - as a manufacturer I can activate this functional obsolesence virtually at will. Simply by encouraging the production of new software and operating system products which require a higher-specification machine, and by withdrawing technical support and sales for older software products, I can render a perfectly functional older machine effectively obsolete. Look at it this way, and you'll see how outrageous the situation is. "It's brand new, and it's fantastically fashionable. Hey, it does pretty much the same as your shabby old clothing, with a few extra refinements (though it does take a minute or two longer to put on). "Of course, you're going to need a new washing machine to wash these clothes, but, hey, once you've got that new washer think of all the new, fashionable clothes that you weren't able to wash before. So get in with the in-crowd, and buy yourself a new suit... and a new washing machine, of course." Let's be aware of the incidental messages that our art is carrying. As artists we may not mean to spread these messages, but they're implicit in our working practices. Let me give you an example: Every time you upload a full-colour JPEG onto the network then whatever its content, whatever the picture depicts, whatever you intend your audience to gather from the image, one of the incidental messages that it's communicating to many of your viewers is "Hey, isn't it about time you splashed out on a new monitor?" The solution the Redundant Technology Initiative puts forward is simple: you don't need to use brand new PC's, you can use PC's that you can afford - that are a few years old, that are cheap or free. But What Can You Do With An Old PC? The next thing that people usually say to me at this point is "Yes, but let's face it, you need the most cutting-edge technology in order to be creative with computers. You can't really do anything exciting with the old stuff." Space probes take many years to get to their desinations, and they have to be designed with reliable, established technology wherever possible. I understand that the recent Mars Rover was controlled by a chip no more powerful than a 286. So when people say, "You can't do anything much interesting with a 286!" I say, "Well, maybe you're right - but instead you could always explore another planet." Just a few years ago we were being sold the equipment that's now languishing in the store cupboard with the promise that we could be creative with it, and now we're being told by the people who sold it to us that that wasn't really true. Or rather, that we can be more creative with their new machine. "Unlock your creativity with our new multimedia PC!" These high-tech products promise user empowerment. 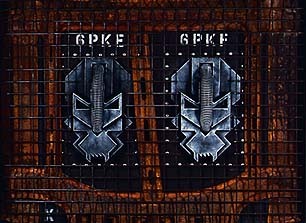 They even use the word "Power" in their names: Power Macintosh, Power PC. Is your creativity locked up? We, computer consumers and users, are beginning to find that these tools which promise empowerment frequently lock us into a distinctly disempowering cycle of upgrade, accelerated obsolesence, replacement, upgrade... We find ourselves outwitted and outgunned by the strategies of technology manufacturers. "Lock your creativity into our new multimedia PC!" What advertisers are asking you to do is to reconfigure your creative practice in such a way that you are dependent on a new, expensive tool, that you, personally, may not be able to afford. So all of a sudden, whereas before you controlled the tools of your own production on your home office desktop, now your creative tools are owned by your employer, or locked into a finace deal that means you're going to have to spend much of the time that you would have spent making art, making money instead. Or perhaps, more insidiously, you'll carry on making art, receive free computer equipment from a generous high-tech sponsor, but the real meaning of what you're doing will be distorted by the expense of the technology you're using. Your art will be sucked into the process of marketing the machines that you use to create it - perhaps unwittingly, you will have become a product demonstrator. Rushing to upgrade doesn't sound so attractive now, does it? In the end I'm not against corporations, and their making money, I'm against exclusivity. I'm against the side-effects of the IT industry's marketing drive, which delivers expensive, exclusive new communication tools to society's winners, and tells eveyone else to get stuffed. The industry is failing to deliver processing power to the people, because it's simply not interested in supplying the completely feasible fifty pound PC. At the moment an "entry level" PC costs around a thousand pounds. It has cost around that much for the last ten years. Okay, so the headline price may be lower, but by the time you've got the monitor, the sound card, the modem and the software extras, you aren't going to have any change from a grand. Yet the technology is established - the industrial capacity is present - to deliver something truly revolutionary - information technology for the masses. But the industry simply isn't interested in delivering. In this month's "Wired" Nicholas Negroponte makes exactly this point. "The potential for very low cost computers is wildly more than we have made of it. Why? Because inexpensive computing is a crummy business. The margins are too low and the economic model is that of a commodity, a prospect that frightens American business. US companies just do not know how to tackle the low end. And by "low end" I don't mean the much vaunted sub-$1000 computer - I mean PCs that cost less than $100. If you're an artist and you use computers in your practice, are you going to use IT in such a way that you define yourself as part of a techno-elite seperated from other artists and audiences by a hefty entrance fee? Is your art extraordinary because you have a cutting edge computer, or because you have a cutting edge imagination? Black & White Photography is Uncreative? I've never heard anyone say, "Black and white photography is artistically inferior. It's outdated and useless, because now we've got colour, and colour does everything that black and white does, it renders tone and form, and it renders colour as well. So photographs in colour are intrisically more creative than black and white pictures." I hope we'd all accept that that's a facile analysis. Yet we accept similar types of argument about computers without question. Is high resolution necessarily better than low resolution? Are 16 million colours necessarily better than 16 colours? Is point-and-click always better than typing at the command line? There's a BIG MONEY INDUSTRY that's completely dedicated to making you upgrade again, and again, and again. Whatever the industry says, it's NOT in the business of providing you with tools that will help you make better art, or come up with ideas that are more challenging, or write better prose, or be more creative, or even make best use of the machine it's just sold you. To consume is not to create. Buying a new computer will not make you more creative. Buying a new computer will not help you be a better artist. Redundant Technology Initiative is a small group of artists. We started ill financed and completely outside the funding system. We mostly still are. Like many artists interested in what is going on in contemporary culture, we wanted to get involved with information technology but we didn't have any money. So we decided to develop strategies for getting getting our hands on information technology - but rather than taking familiar routes, either by raising money to pay for expensive new computers, or by approaching high-tech sponsors to see whether they would give us some of their new products to demonstrate, we started with the premise that we'd use the sort of technology that we could afford, (computers that were very cheap, or even free) and then make it our task to discover ways in which we could use that low cost technology to be creative. Our initial means of doing this was by scrounging around everyone we knew, and asking them to give us their outdated machines. Quickly we became aware that even quite high specification machines (with memory measured in megabytes) were being thrown into skips. We recovered several of these - 086's and 286's - and were amazed to find out that many, if not most of them still worked. Skips and dumpsters quickly became one of RTI's significant sources of useful machinery. To supplement our "guerrila" approach of skip raiding to recover equipment, we also developed a communications strategy to help us expand our informal scrounging network to include not just individuals who we knew, but the far more significant constituency of major technology users - high-tech business. This marketing campaign was aimed specifically at high-tech business, and it asked them to donate their trash technology to the project as a constructive alternative to throwing it into the skip. It proved to be so successful that we simply didn't dare to distribute these leaflets as systematically as we'd planned to, for fear of provoking too large a response. This whole approach came partly out of my background as a junk sculptor. I was very familiar with diving into skips and recovering materials that I then made into art. I think that junk is aparticularly interesting substance. It illuminates a lot about the culture that throws it away and gives it a value of zero. Trash made into art also serves to highlight the value of creativity - it's creative ideas that change an object of zero value into something interesting and possibly valuable - a work of art - something that is explicitly declared a carrier of meaning and an embodiment of insight. Having waited all that time for a computer, I then found myself surrounded by them! For the preceeding months I'd been using my own machine in the office - an Amiga with ten megabytes of memory and a two-hundred megabyte hard disk - which I found quite sufficient for my purposes. I realised that these Macintoshes which the university judged to be obsolete and useless had pretty much the same specification as my machine! As well as targeting businesses, we've diversified our marketing campaign to raise awareness of the issues surrounding trash technology and its disposal, and we've been asking concerned individuals to get involved as well. We've been asking some fairly simple questions about PC use. An interesting feature of this "Alert Box" graphical design is that it implies a requirement for the viewer to interact - to make a decision. It suggests that the viewer is involved in the process - either positively, by helping RTI, or negatively, through inaction. But either way around, the marketing approach that we've adopted suggests that you, the viewer, are involved whether you decide to support RTI's campaign or not. We're suggesting that this sort of real-world interactivity is a lot more exciting than the limited "press button 'a' or press button'b'" pseudo-interactivity of many digital artworks. By bringing along their old computers the public can make a real contribution to the physical nature of our artworks, can express support for our campaign, question the accelerated redundancy of computer equipment, and help to save the planet, too. The response has been very encouraging. People who've been keeping their old LC or 386 in the attic have given the issue some thought, and realised that the case they've been saving their old computer for "just in case" just isn't going to happen. This piece is the result of the recovery process. "Redundant Array" involved collecting donated computers, reprogramming them wherever possible, and installing a program that we'd written (the multicoloured "X's" flicker, wobble and shake, controlled by a simple program written in eight-bit Turbo Pascal). We got to work on machines that wouldn't boot, stripping them down for parts to repair other machines, and we used the stripped cases in the piece as well. Then, in addition to that, we were also given whole units that were irrevocably dead, or parts that we knew we would never find useful. But we sdidn't discard them - we included them in the piece as well. So in a sense this piece is a process artwork - it's emerged from the process of computer recovery, repair, stripping for parts and the definitive rejection of truly defunct components. 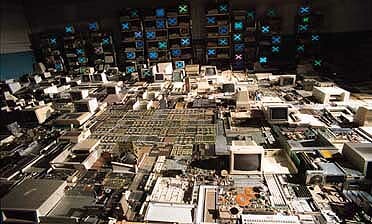 But in the piece even the dead components are used for a creative purpose, to create this field which some people have described as a science-fiction cityscape, but which is also just an abstract side effect of an art-making process from which we've cut out the whole concept of "redundancy". 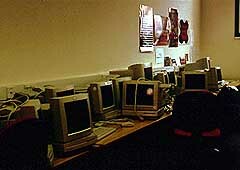 The typical computers in use in this piece are 086's, 286's and some 386's. The lowest specification machine that is active in the piece has just 256kB of memory, with twin 5.25 inch floppy drives - no hard disk. Yet we've been able to use it to creative effect. So we're challenging the typical suggestion that to be creative you need a high specification multimedia machine. Since the project has started we've upgraded - and it didn't cost us a penny! These machines are mostly 386's and 486's given to us following the publicity of the previous installation. We've applied our programming knowledge to transform these machines into a flickering, scrolling, colour-changing video wall which displays texts from the hard disks of each machine. The motion of the scroller continually changes independently on each screen, and textures ripple and flow randomly through the lettering. We have a series of random control processes built into the program that cycle and permute look-up tables that map the character shapes to the screen, and we also have erosive factors which disrupt the lettering. One of the things we're particularly interested in is that way that the interaction of these multiple control processes cause apparently structured visual effects. The texts themselves are things that we're interested in - but we've deliberatley been casual or arbitrary in their selection. Each time we re-make the piece we include new texts, perhaps things that people have emailed to us, or things we've been studying of discussing, or things that we turn up by chance that we find amusing or interesting. In fact, we've lost track of the many hundreds of files that are in the piece now, and we're constantly writing more ourselves, or harvesting them from the internet. 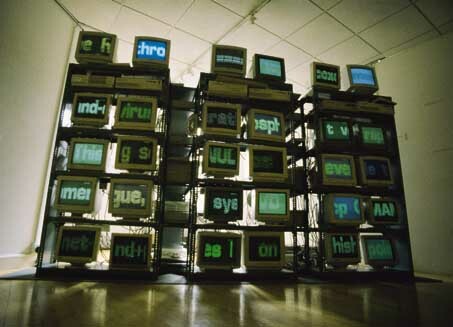 The text is a sort of collective stream of consciousness for Redundant Technology Initiative. We like the way that to pull a coherent text out of the piece you have to focus your attention on one particular screen - which means, of course, that you miss everything else that's being displayed - you can't see it all. Which is very much like the network itself. We at Redundant Technology Initiative feel that information technology should be available to all. And we believe that people should be able to use IT for their own purposes, as empowering technology. So what are we doing about it? We're taking computers from the stream of machines that are being donated to us, and we're proposing to get these machines online, and give the public access to that technology at a very, very low cost. Rather than the five pounds and hour that is charged by cybercafes, we're proposing to charge people a nominal fee of five pounds a week. We're raising funds right now to make this redundant technology access centre a reality, and I hope to be able to spread some good news about the results of our efforts within the next month or so. A lot of IT access projects suggest that they're empowering their users - but seem to foster a dependency on the machinery that they provide. We don't believe that booking two or four hours per week in a high-tech IT suite constitutes useful, empowering access to technology. By dealing with computer equivalents of Ford Escorts, not Formula Ones, RTI's Access Space project will encourage users not to be forever dependent on the facilities that we'll provide - we can show them how to start to teach themselves about computers, and give them the time and space to get on with it. Then, if they feel that they want to develop their own involvement with IT, they'll be able to pick up the sorts of computers we'll be using in the space very cheaply from used computer resellers, and we'll have the freeware and shareware applications to get them going independently. Incidentally, I should stress that because of the expense involved we won't be making use of much commercial software - we'll be making use of open source software, which is software built and continuously tested by community-minded enthusiasts, that's legitimately distributed for free on the internet, such as the LINUX operating system. Future Arts Spending - How Much on Technology, How Much on Production? This is something that is well outside RTI's remit, but that doesn't mean we don't have opinions about it! Artists are getting more and more heavily involved with information technology, and we think that this is very appropriate, because art should engage with contemporary culture, and the rest of our culture is assimilating IT very, very quickly. But, for reasons that I've alreay described, keeping up to date with cutting-edge technology is always going to cost �1000 per unit per year. So as artists get more heavily involved in technology we have to ask ourselves, "Do we want an increasing proportion of arts money to be spent on high-tech tools with an artificially shortened lifespan? Do we want a smaller and smaller proportion of arts money to be spent on other aspects of production?" RTI's response to this dilemma is a resounding "No!" Now, while keeping up with cutting-edge technology will always cost �1000 per unit per year, there is something interesting happening. The processing power of zero-cost, trash technology is doubling every year. So let's stop being victims of, and contributors to, this consumerist techno-frenzy, and use it!